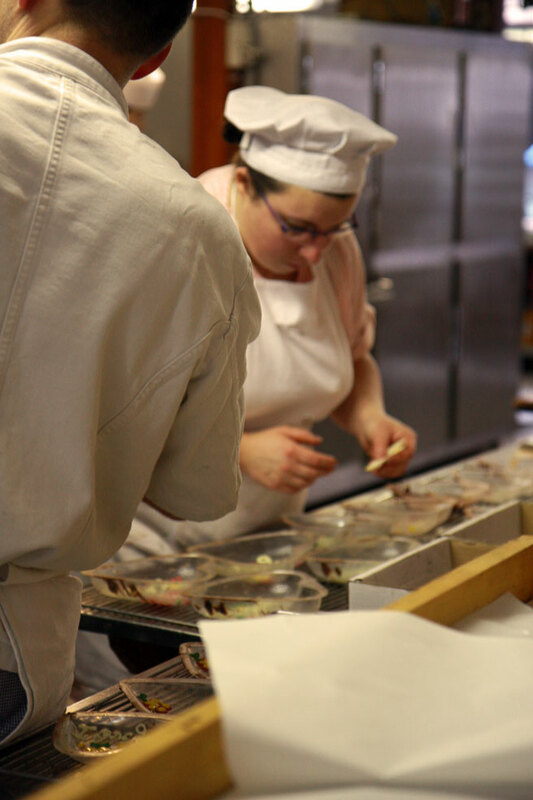 In the midst of the frackas of the biennial SIRHA salon hosting the World Pastry Cup and the Bocuse d'Or competition, I managed to slip away one morning to visit the kitchens at Bernachon in the 6eme. I rustled up a group and we met for a little while that morning, really a dream-like oasis nestled in between the two events. 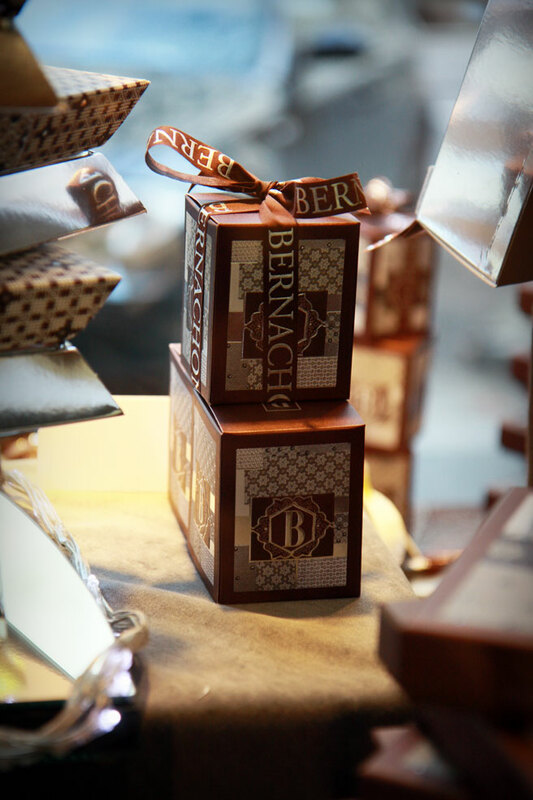 Bernachon is one of the only European chocolatiers that selects and imports raw cocoa beans direct from producers in various countries and roasts each type of bean separately, creating their 62 house chocolate types by mixing the roasted crushed beans in specific ratios. 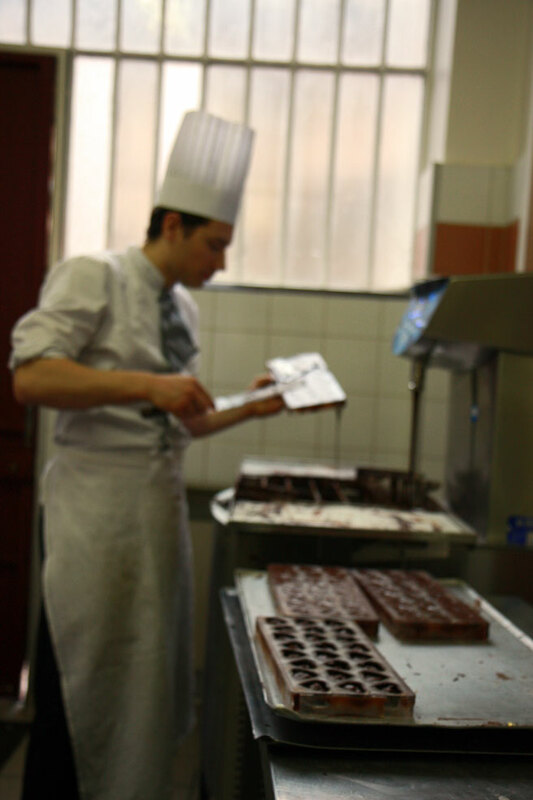 We toured the artisan chocolate maker's facility with a maitre chocolatier named Pascal, who explained to us step by step how the chocolate is produced from cocoa bean to Palet d'Or, the house specialty. Milk or dark... What is your poison? Pascal explained each step along the process in rapid-fire progression beginning at the sacks of beans. 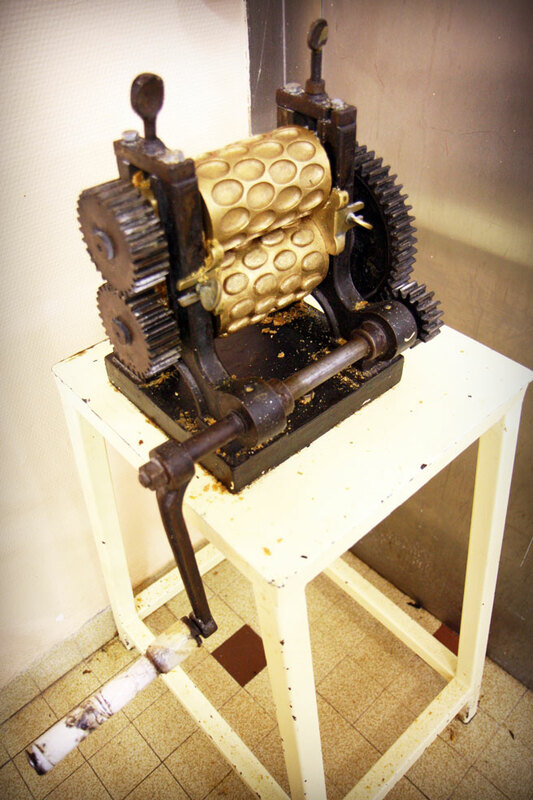 I did my best to take in the aromas, the information, the concepts introduced one by one as we moved through the workshop to produce this beautiful product, and progressively we sank deeper and deeper into the world of the chocolate maker. 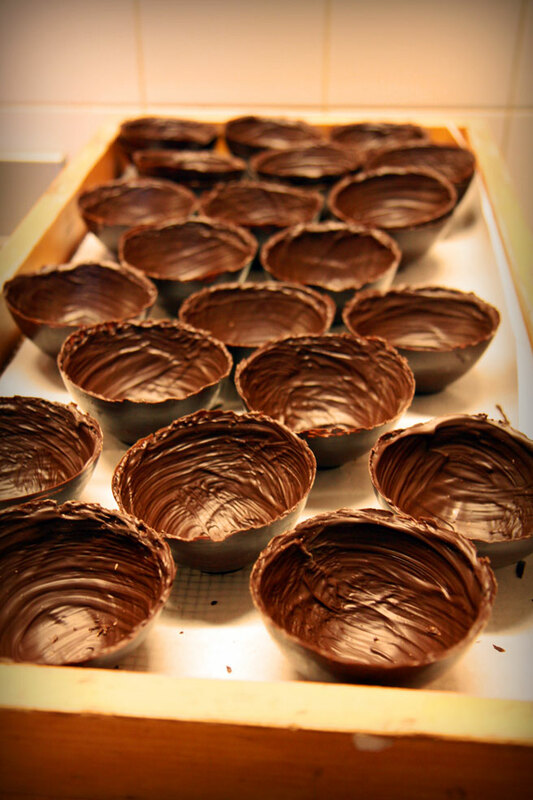 The young stagieres were rolling ganache. 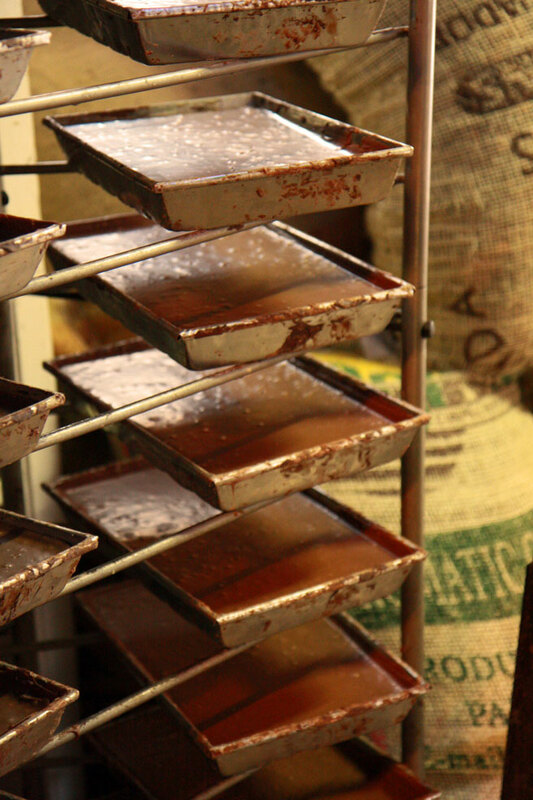 A rack full of enormous pans of fresh Bernachon chocolate were stacked in a back room, cooling from that morning's production. We happened upon one treasure after the next, each rich with a story. 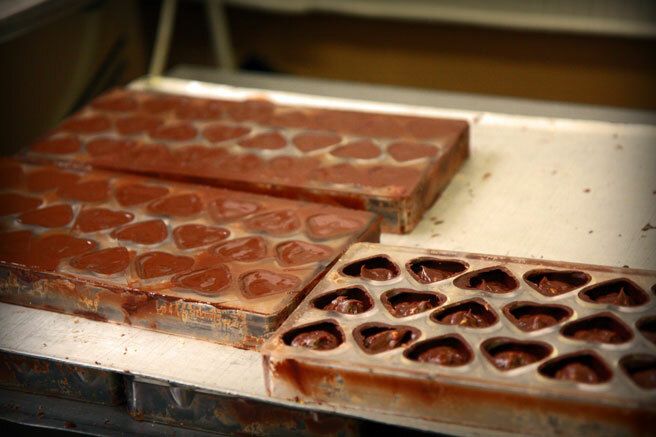 A peek into a courtyard full of bicycles, and through to the molding facility where they were preparing special chocolates for Valentine's Day. 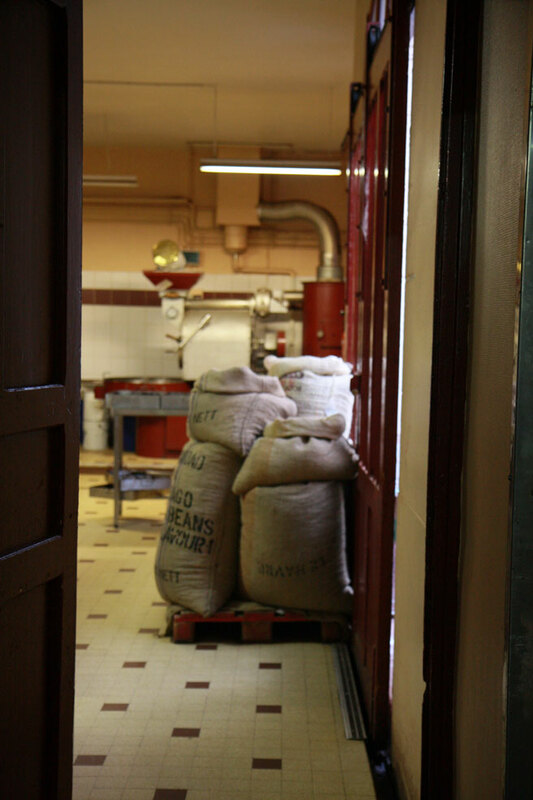 Something that really struck me was the fact that the beans are roasted first, then stored in bins according to provenance, each bin containing chocolate that smells completely different from one another. 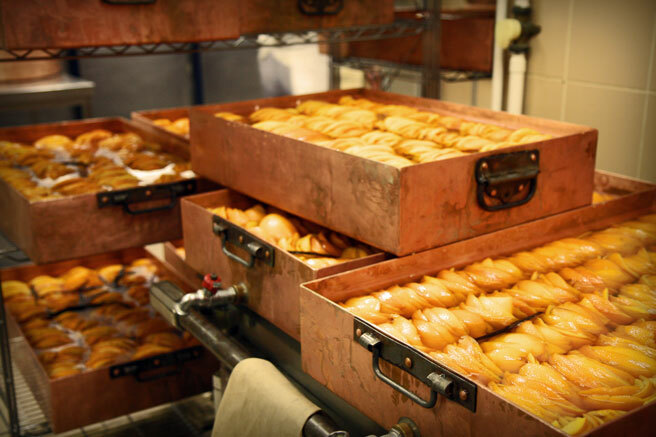 One smelled more green than the next, the other more toasty, some had smoky aromas. 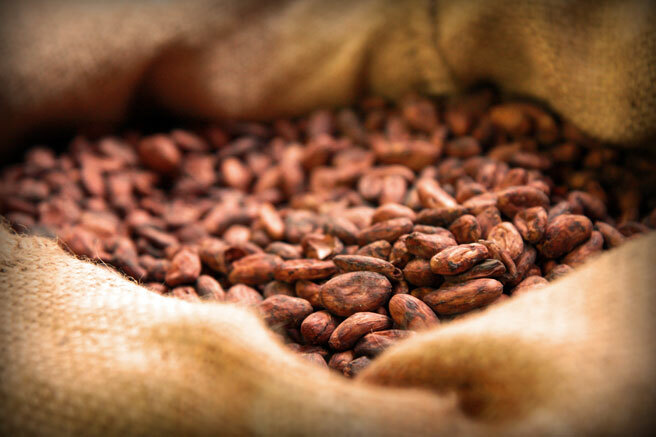 I never really thought much in the past about how differing provenance of the bean can make the difference in the complexity and flavors of a chocolate. Silly me. All this time I had been thinking about sitting down and pulling on that ribbon from the chocolates box. This visit to the source got me thinking outside of just my own selfish reception of the chocolates, more than their simple decadence or their comfort factor. Before this visit I didn't really have much more of an index in my mind aside from a very short vocabulary of brands and labels but now that is changing. At the same time, this whole idea of the terroir didn't seem outlandish either, since this kind of transmission of the qualities of land and place is naturally coming through so many things in our food world. We talk about the acorn fed black hams from Spain, we talk about the grapes grown along the river in the Northern Cotes du Rhone, we talk about the cows and their pasture pushing from volcanic soil that makes a Saint Nectaire. Every product, a history, an expertise, a story, a place. Why not chocolate? On the one hand, there is the terroir, which clearly makes a huge difference when I see Pascal scoop up a handful of one particular provenance and has us compare the aroma with that of another. 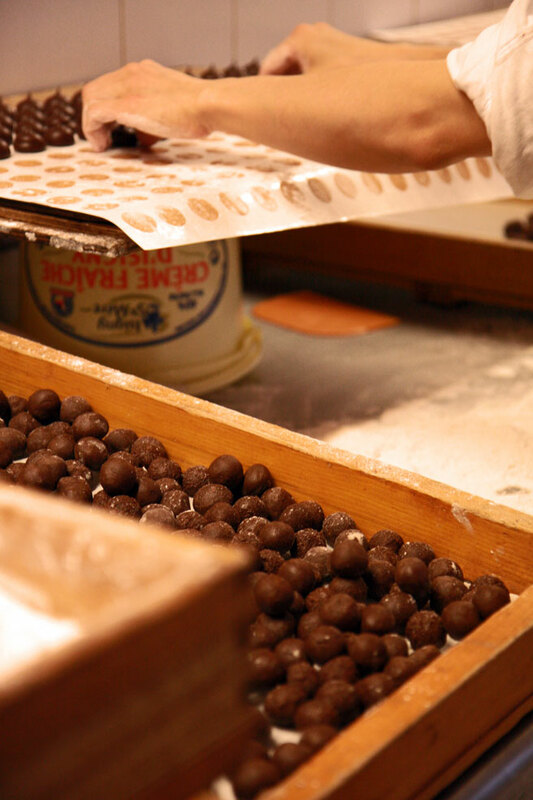 Then there is the knowledge that the Bernachon family has developed in their mixing of flavors and treatment during torrefaction of beans from 8 separate countries, crushing, heating, mixing, and creation of the different blends meant for the various uses - the ganaches, the fillings, the coatings, the decorative elements and textures each meant to have its own quality, for 62 different types of chocolate altogether. While I was there, I counted 10 employees, and my informal survey revealed that apart from a couple of lucky stagieres from foreign countries who get 5 weeks, each of the workers had been at Bernachon for many years, some nearly their whole lives. 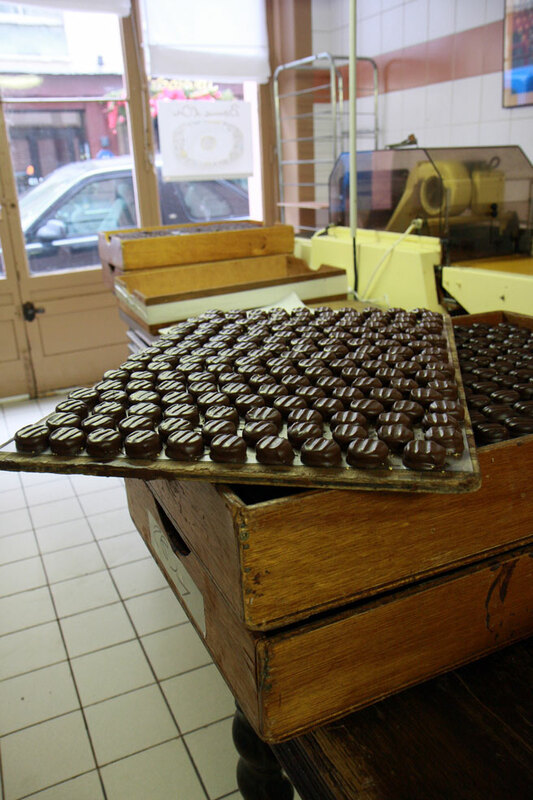 Those who were on the track to maitre chocolatier had been to school and passed their examinations, and had done internships at Bernachon before making the rounds at the top chocolate makers in France, then coming back to stay. 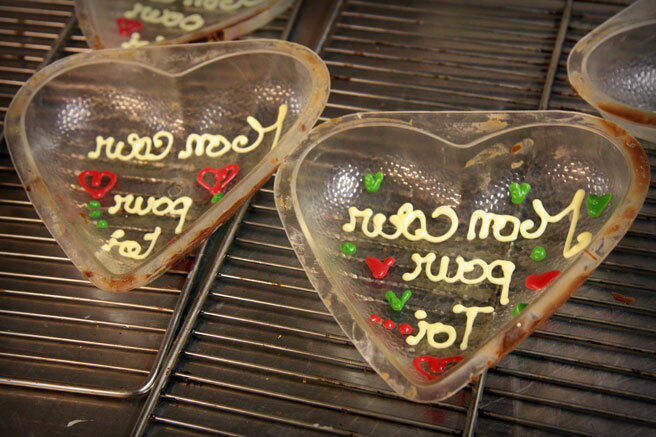 Pascal said that the job satisfaction comes from the fact that they touch and know the product completely - from A to Z. 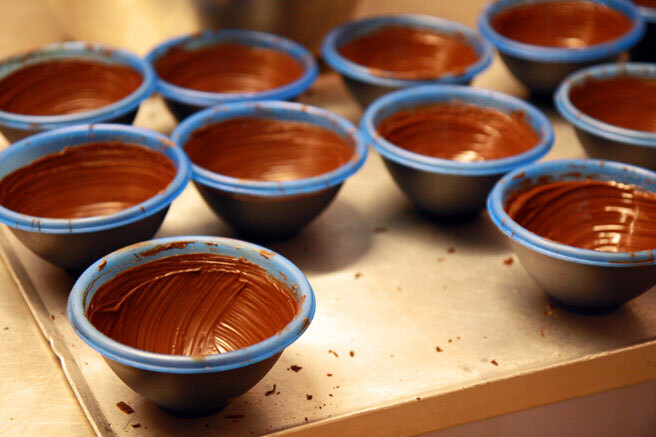 The ability to really have an impact not only on the finish of the chocolates but on the very basics of flavor makes it very much worthwhile. I've been obsessing with chocolate ever since I made my chocolate-brie dessert a few days ago. This post and these lovely photos could not be more timely. Outstanding post, Lucy. I brought home some chocolate from Bernachon - the truffles and the chocolate bars are spectacular. My family loved them. I wish that I had bought more! Thank you for the wonderful tour through a fascinating place. 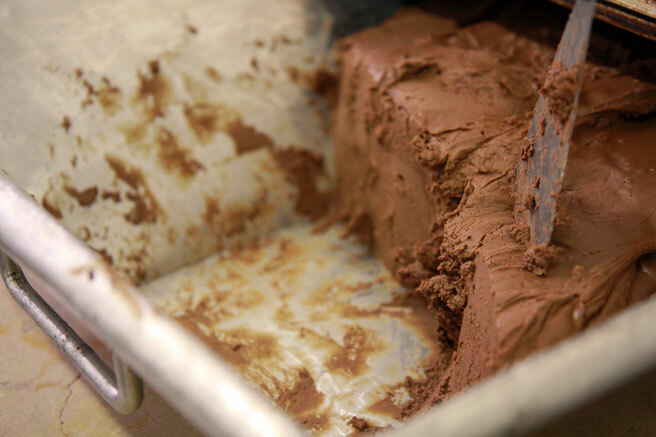 I am a chocolate fiend and this made me want to get on a plane and visit Bernachon! Envious. Great pictures btw. It feels like peeking behind the scenes with you. You really all should go and get back in the kitchen the next chance you get. The aromas are very rich and it is so educational. 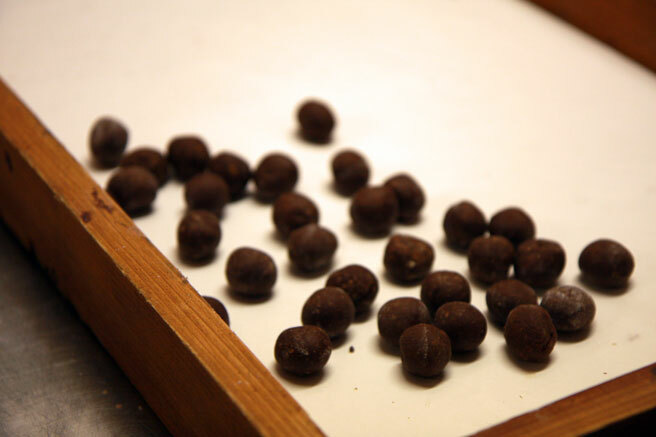 Your photos are lovely, and your description of the chocolate beans reminds me of coffee and the varied nuances between beans from different regions and preparations. 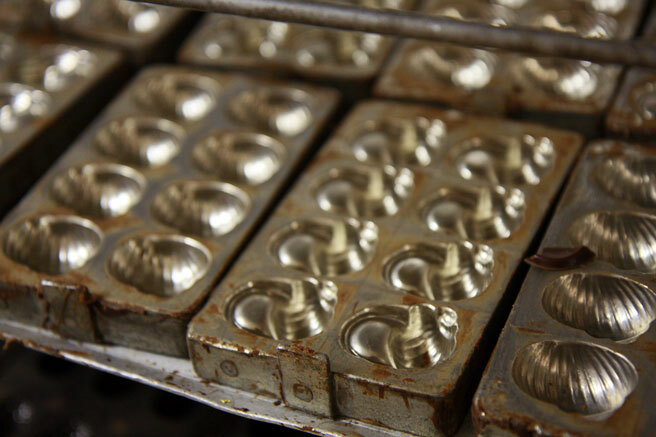 Thank you for sharing a backstage look into the making of some of our favorite treats! I am facinated with everything you write. I have not been to France or Europe for that matter but when I read your blog, I am magically transported to those far away places and instantly engulfed in your stories and pictures. Thank you for bringing all of Europes best to me. Thankyou for another beautiful, thoughtful and wonderful post. I loved exploring backstage at Bernachon with you - because after your post I felt as if I had been there too. You have an extraordinary way with words and images. Your photographs are wonderful! And such a beautiful post, too!! I love Bernachon chocolate - what a treat! I look forward to visiting Lyon and Bernachon in the future. 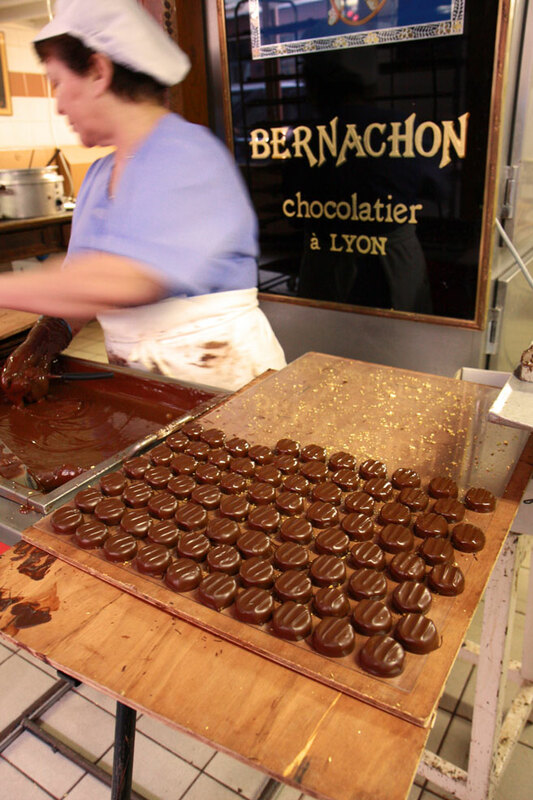 Thank goodness Denise Acabo carries theri chocolates in Paris, or I would still be in the dark about Bernachon. My favorite is the dark chocolate bar with caramel au beurre sale. I wish I had one right now!!! Thank you so much! I greatly enjoyed this post. Your pictures are so beautiful. All that chocolate is making me hungry! Whenever I go home, I take Bill to see an artidan chocolatier near my parents' house. It is such a real treat! Gorgeous pics!